The largely Arabo-centric approach to the academic study of tafsir has resulted in a lack of literature exploring the diversity of Qur'anic interpretation in other areas of the Muslim-majority world. The essays in The Qur'an in the Malay-Indonesian World resolve this, aiming to expand our knowledge of tafsir and its history in the Malay-Indonesian world. 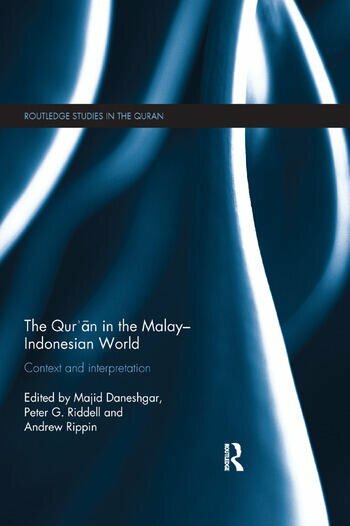 Highlighting the scope of Qur'anic interpretation in the Malay world in its various vernaculars, it also contextualizes this work to reveal its place as part of the wider Islamic world, especially through its connections to the Arab world, and demonstrates the strength of these connections. The volume is divided into three parts written primarily by scholars from Malaysia and Indonesia. Beginning with a historical overview, it then moves into chapters with a more specifically regional focus to conclude with a thematic approach by looking at topics of some controversy in the broader world. Presenting new examinations of an under-researched topic, this book will be of interest to students and scholars of Islamic studies and Southeast Asian studies. Majid Daneshgar is Lecturer in Islamic Studies at the University of Otago, New Zealand. His research focuses on Islam in the Malay-Indonesian World, and Islam and Science in the 19th and early 20th Centuries. Peter G. Riddell is Vice Principal (Academic) at the Melbourne School of Theology and Professorial Research Associate in History at SOAS, the University of London. He has published widely on the study of Southeast Asia, Islam and Christian-Muslim Relations. Andrew Rippin is Professor Emeritus of Islamic history at the University of Victoria, Canada and Senior Research Fellow of Qur'anic studies at the Institute of Ismaili Studies, London. "The books is very rich in information and it is therefore fortunate that the work ends with an index, not only containing personal names, but also the names of organizations, books, and some concepts. To specialists who follow developments in Qur?an interpretation in the Malay-Indonesian world, the present book contains a lot of materials which is familiar and have been dealt with in previous studies, but it definitely has also new things to offer. For beginning students who want to familiarize themselves with tafsir in the Malay-Indonesian world the present book is an excellent starting point." "…the volume is a good introduction to opening up new vistas of research into what the Qur’an means to the Malay-Indonesian world and the contributors are to be congratulated for their commendable effort." "With the diversity of the topics, engagement of past and present, and issues and challenges tackled, the volume provides significant insider perspectives and opens new vistas for exploring the unique dimensions of Qur’anic studies in this region."